BOTH sides saved the best for last in a match that reached a climatic ending. When Joe Taylor headed in at the back post eight minutes from time, no-one would have expected Whitby to stage a recovery, despite the Seasiders having their moments. But for a team that boasts the second best defensive record in the league, Worksop will be disappointed to drop two points in such a manner. Having already had a goal disallowed late on, Whitby grabbed an equaliser from Andrew Appleby's penalty, two minutes into injury-time, after Ryan Ludlam had handballed on the line from a corner. At the start, Worksop looked to have put their midweek FA Trophy exit behind them and purposefully set about testing the Whitby defence that contained captain Graham Williams, making his 300th appearance for the club. As early as the second minute Matty Caudwell narrowly missed the target with a strike from outside the box and Mark Obern had to be on his guard to make a decisive tackle when Paul Sykes was about to pull the trigger. In the 12th minute Chris Beardsley was denied his second goal in a Tigers shirt when David Campbell pulled out a lighting reaction save from the young striker's header. But after dictating play for the opening quarter, Worksop lost the influential Neil Glasser to a groin strain and, in doing so, they released their grip in the middle of the park. The game swung in Whitby's favour and in the 22nd minute the visitors wasted a golden opportunity to take the lead from a break away when Anthony Omerod failed to pick out Appleby on the left with a man advantage, and that allowed Worksop to recover. But despite camping in the Worksop half for almost 10 minutes Whitby did not severely test Dave McCarthy and Worksop weathered the storm. The hosts did end the half on a positive note when Alex Callery fired over the bar in the 40th minute and Kevin Davies went close just before half-time. As the second half kicked off, Whitby's Scott Nicholson should have put his side ahead when he ran onto Darran Craddock's pass and, with a clear sight on goal, scuffed his shot at McCarthy. 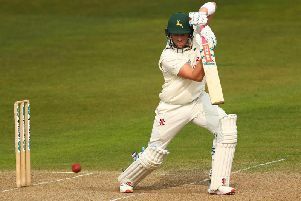 With play still distorted by needless niggles, a lull followed until Caudwell lifted crowd with a run on the left and sparked some life back into the game. Just past the hour, Callery was denied by a block following a corner while Taylor's follow-up also failed to get through. At the other end, in the 74th minute, Appleby ended a teasing run with a shot that brought a fine save out of McCarthy, who tipped over the bar. But Worksop stole ahead when, from a Steve Hawes free-kick, Taylor got his first league goal for Worksop and sparked an action-packed finish. In the 90th minute Nicholson had the ball in the net but the 'goal' was disallowed for climbing on Davies. But Worksop did not heed the warning and from David McTiexnan's corner Anthony Hall headed the ball goalward only for Ludlam's hand to prevent the ball crossing the line and earn the defender a red card and Whitby a penalty, which Appleby converted despite McCarthy's fingertip touch. In injury-time substitute Adam Muller spurned a chance for a late winner when he blazed over the top.